Tenerife, a Spanish island, is the largest of the seven Canary Islands in the Atlantic Ocean off the coast of Africa. Santa Cruz de Tenerife is the second biggest city in the archipelago, the capital of the island and the head of the cabildo insular (island government); it is also officially co-capital of the autonomous community of the Canary Islands together with Las Palmas de Gran Canaria (located in the island of Gran Canaria), with whom it shares governmental institutions such as Presidency, Parliament and ministries. The island is located at 28°19′N, 16°34′W and has a surface area of 2,034 km² (785 sq.mi). Like the rest of the Canary Islands, it is of volcanic origin. The last of the three eruptions that created the island happened about 3.5M years ago, although small murmurs occur. The most recent earthquake of about 4 on the Richter scale was in 2002. The highest point of Spain, Teide (3,718 m), is on this island. The island itself is clearly divided into a very dry southern part and a very humid and green north. 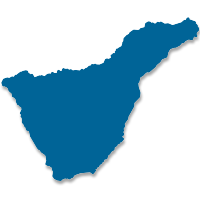 First adopted as maritime registry flag of the maritime province of the Canary Islands. When the other province was created, this became the flag of the Santa Cruz de Tenerife province. Finally, it was adopted as flag of Tenerife by the Island's Council. Order Consejería de Presidencia y Justicia of 9 may 1989 (BOC of 22 may). Granted by Queen Juana of Castile on 23 march 1510. The town of La Laguna , being the capital of the island during the first times after the Conquest, adopted this emblem as its own. When in 1912 the Cabildo Insular (Island Council) was created, it took the same arms. 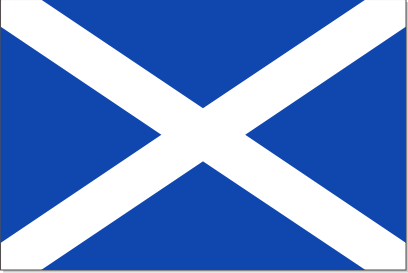 Or, an island sinople with a volcano proper soitting fire, all on waves azure and silver, between a castle gules and a lion of the same and above the Archangel Saintn Michael proper, holding a spear in one hand and a shiels in the other. Border gules, with the inscription Thenerife Me Fecit. Cabildo Insular de Tenerife in gold letters. Ensigned with, royal crown, open. In order to distinguish these arms from those of La Laguna, the Cabildo adds two palms under the point. 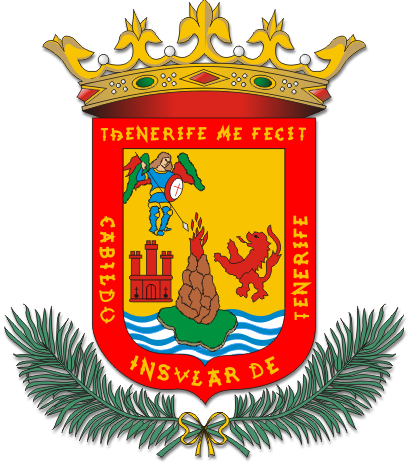 The elements n the arms symbolize the incorporation of the island of Tenerife to the Crown of Castile and Leon and its evangelization under the patronage of Saint Michael.